From the back woods of the Great Northwest, comes a dynamic ensemble ready to rock your world! 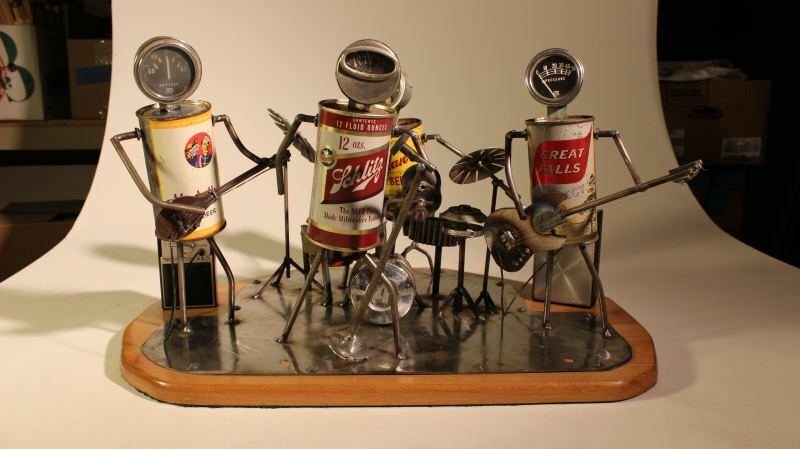 This is not your run-of-the-mill tin can band nor is it Heavy Metal, this here is James Tubbs and his Beer Can Band. Though their backgrounds are clouded in controversy, and it is hard to distinguish fiction from absolute crap, these boys are ready to entertain at a moments notice. Anytime, anywhere, anyplace, ........ anywho? Though their tastes are varied, and some time the slurred lyric gets lost behind the melodic impressions of the unit, their main staple is a bit of the good ol' country swing mixed with a bit of rock ad-lib by both The Harvis (the lead guitar) and Ramses ( the bass). Last summer, on July 17th, in front of a sold out house at Clancy's Crab Broiler, the group had an epiphany. No longer will we keep ourselves bottled up, it leads to stale sounds...... it is time to rectify and amplify! There is no tomorrow, only today! The road leads straight ahead and it is our future! With a loaded van full of all kinds of instruments, a few sleeping bags, a camp stove, and a ton of junk food they set out, pedal to the metal, to find their musical destiny on the road to rock god-um! After 103 miles travelled, 158 songs sang to lyrics that may appear to be similar to the original, 25 bags of chips and who knows how many sodas........ the future legends of the airwaves took a brief moment to meet the press. While at the office of the Redcreek Ridge Gazette, they released their first, official press statement: "In search of a van or larger vehicle, preferably one that will travel more than 104 miles on a tank of gas. Willing to trade services. We do birthday parties"